2/2009: Recently, the Borough Council of High Bridge unanimously passed ordinance #2008-26 authorizing bonding for the remediation of Lake Solitude Dam. The public awareness campaign initiated by Union Forge Heritage Association produced hundreds of letters, emails and other correspondence from across the United States in support of saving this iconic historic structure. This effort also spurred several proposals for adaptive use of Lake Solitude Dam for hydroelectric power. Currently, the Borough of High Bridge is in contractual negotiations and is in process of obtaining the necessary permits from the Federal Energy Regulatory Commission. 5/2009: The Borough of High Bridge has secured a low-interest loan of $5.6 million from the state of New Jersey to repair Lake Solitude Dam. They plan to move ahead with repairs shortly. 8/2010: The Borough of High Bridge indicates that they are working with NJ DEP regarding remediation of Lake Solitude Dam. Work is scheduled to begin during fall of this year. 3/2011: The Borough of High Bridge voted on March 24 to approve a contractor to complete dam remediation. 5/2011: According to local advocates, remediation work has begun and is expected to continue throughout summer, 2011. The last known remaining New Jersey example of an I-beam dam, Lake Solitude Dam, built in 1909 by master engineer Frank S. Tainter, to provide hydroelectric power for the Taylor-Wharton Iron and Steel Company, a prominent munitions manufacturer whose history spans from the American Revolutionary War through the Korean War. The dam holds significance for its civil engineering design and for the role that it played in permitting Taylor-Wharton ironworks, downstream, to expand. 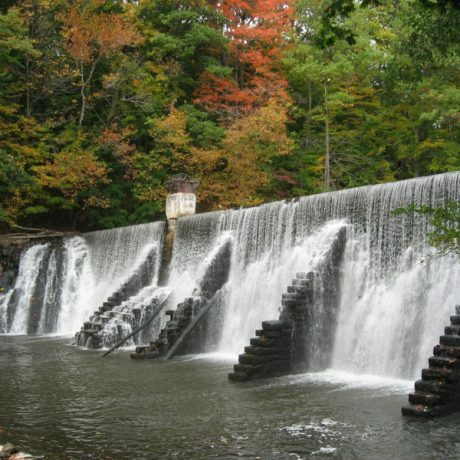 Both the dam and 35-acre Lake Solitude, created by the dam, are eligible for listing in the New Jersey and National Registers of Historic Places individually as well as part of a possible larger industrial historic district and the Taylor Iron Workers Historical Greenway connecting Columbia Trail to the Amesbury Furnace. While the dam’s history is acknowledged, borough officials grapple with the cost of repairing the 1909 dam or breaching it. Interestingly, there is renewed interest in rebuilding a hydroelectric plant at Lake Solitude dam, however, no firm proposals have been made. The Mayor and Council put 13 years of effort into purchasing the property and $200,000+ in remediation plans, resulting now in full DEP approval. Unfortunately, the Borough Council has until August 2008 to act. Through this long time period as elected officials have come and gone, sentiments have changed and some now believe that although breaching costs upfront are greater, they advocate that it is more cost-effective measure in the long term with no annual maintenance or inspection costs. Some favor returning the river to its natural course, one it has not taken since 1858. However, breaching would not only create a long-term historical loss, it would drain Lake Solitude, a High Bridge landmark, and destroy the natural habitat for wildlife dependent upon the lake. Additionally, financial costs would be incurred for the dredging, silt and contaminated soils removal that would not be incurred were the dam to remain intact. Preservation of the Lake Solitude Dam and Lake is an important linkage to not only High Bridge’s past but to a 6-mile hiking trail linking the borough’s open spaces. It is far more cost-effective, can do nothing but spur tourism and local business, and has the potential to revert to its historical origins by providing hydroelectric power.